BeautyBiotics – Beautiful skin in just 5 simple steps! Recently i have heard people around me asking me what skincare or makeup i have been using, as they mention i look younger. Hmm…nothing really change much from my diet, and i have been sleeping less as well due to studies and lots of assignments from school. I guess my best stress-fix on my skin will be from BeautyBiotics. Beautiful skin in just 5 simple steps! Beautiful skin is just 5 simple steps away! 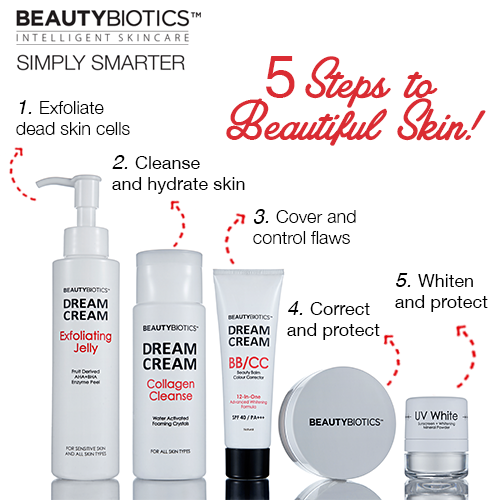 BeautyBiotics Dream Cream range is your 5-step solution to flawless skin! In a nutshell, this revolutionary range addresses skin problems thoroughly by renewing, correcting and protecting skin.